One cannot close this History of Trading in Tivoli without mentioning St. Stephen’s Anglican Church. The church was built in 1873 as a Chapel of Ease to Christ Church, to cater especially for the poor working folk of Tivoli. It is a grade II* listed building by the architect John Middleton. 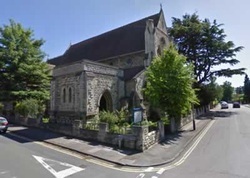 It originally consisted of what is today the Choir and Sanctuary area, but due to its popularity it was extended to its present dimensions by 1883. The interior of the church is far more impressive than its exterior appearance might suggest and is well worth a visit.